...bringing exciting and innovative hands-on workshops exploring sustainability to children and young people in schools across Cornwall. Sustainability education is brought to life for children with hands-on workshops exploring renewable energy technologies, the challenges of climate change and ways in which we, both individually and collectively, can make a positive impact. We work with children of all ages in schools across the county and beyond to assist in the delivery of green education. A typical full day’s outreach incorporates four sessions lasting 60-75 minutes each. You can choose two topics in one day for example two sessions on solar and two on wind, or have one themed day across year groups. Each session is suitable for up to 30 children. Workshops are conducted inside a large ‘Planet Earth’ structure which can be erected in your school hall or other large indoor space. Explore the power of the sun and discover how it provides the basis for all life on earth. Investigate how sunlight can be harnessed to make renewable energy and build a solar powered jiggling monster! Construct solar ovens to explore the principles of insulation and solar thermal energy and discover how this technology can be used to heat our homes. 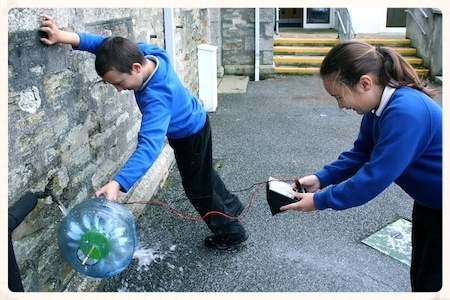 Investigate the potential and kinetic energy of water and construct a hydro-electric turbine to convert the energy of moving water into electricity. Explore how water is a renewable resource and the benefits this can have for our planet. Investigate where wind comes from and how it’s energy has been harnessed by us throughout history. Discover how wind turbines work by assembling your own small scale device and designing the blades, before testing your turbine outdoors. Generate, measure and store electricity and evaluate your turbine blade design. Discover how we can transfer the energy of our oceans waves into clean electricity. Explore how waves are made and learn more about the Wave Hub project happening right here on our doorstep in Hayle. 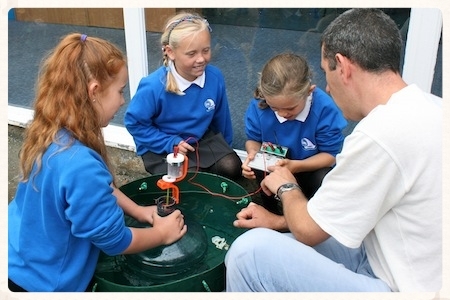 We've developed small scale working models of a wave energy device which children will assemble and test to generate electricity and discover more about how this newly emerging technology works. Trace the journey of one of our most important natural resources and learn more about the water cycle. Investigate what it would be like to live in a country where access to clean water is limited through our ‘balance the bucket’ game. Explore why it is important to conserve water and discover how much energy is required to get clean water to our taps through our water filtration experiment.